4QD’s Bell throttle assembly is a finger-tip operated ‘position sensor’ which is also very suitable for use as a position sensor for a foot pedal operated throttle. The diagram shows how it might be done. The foot pedal has an operator (a round tipped bolt, maybe) protruding from its rear whose head contacts the lever of the throttle assembly. As the foot pedal is depressed, the operating ‘bolt’ bears on the lever and works the throttle pot. There is sliding between the bolt head and the throttle lever – but this is steel against vinyl and proves to be very reliable even in the dusty, dirty and wet conditions encountered on a golf course. The vinyl lever cap is, in any event, very easy to replace. We have at least one customer who has been using this system on a golf buggy for many years without trouble. 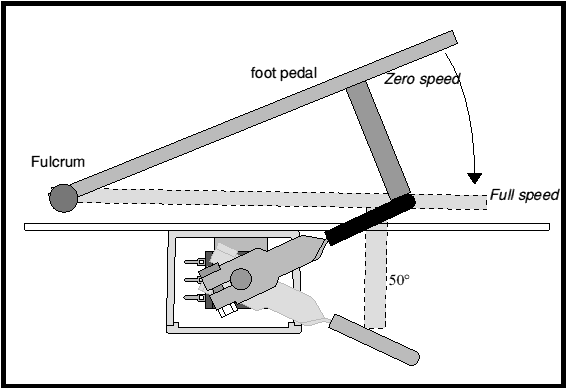 The foot pedal will need its own return spring (the Bell Throttle has a light spring) and suitable travel stops.